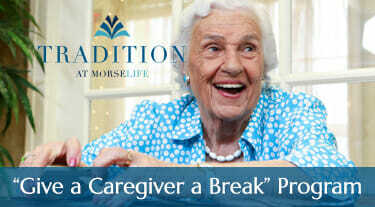 Assisted Living – Give a Caregiver a Break! You devote your time to taking care of an older loved one. When do you have time to take care of yourself and all of your responsibilities? While you are maintaining your loved one’s freedom, you’ve lost your own. There is a solution. It’s time to explore richer, fuller lives that both you and your loved one deserve. It’s about time to find that essential helping hand and restore your peace of mind. It’s time to call Tradition at MorseLife. The Tradition fosters independence in a supportive environment. Our luxury, full-service, senior residence offers rental for assisted living and support services in independent living for your loved one who needs daily assistance. This gives you time to take care of yourself and your own needs while your family member gets full attention. And there’s so much more that awaits at Tradition at MorseLife. Along with the privacy of an elegant apartment, Tradition makes life a pleasure with gourmet kosher meals, housekeeping services, transportation, 24/7 security and an array of both social and engaging activities. Our highly-trained staff is always available for help and devoted to ensuring your loved one’s happiness, health and comfort. Be assured that we will take care of all of your loved one’s needs. Because it’s about time that YOU had the time to take care of all of your own. Tradition. It Feels Like Home.